Malaysia lies in the heart of South-East Asia (Asean, or SE-Asia), near-by Thailand, Brunei, Indonesia, Singapore, Hong Kong and the Philippines. You can reach it by airplane with Malaysia Airlines, which lands in Kuala Lumpur, the capital city of Malaysia. 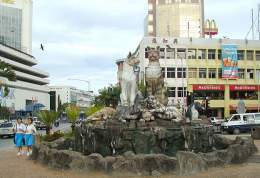 Kuching ("Cat City") is a medium-sized town on Eastern Island of Borneo, in the State Sarawak. Kuching weather is warm all-year round with tropical climate temperatures of about 25-30 degrees celsius. There's some days with rain (and haze) around October to February, but it will only rain for an hour or so a day, refreshing the air. And it's definitely worth a visit if you haven't yet been there! This Kuching Guide is intended as complete, compact & pragmatic overview and guide to help you get around in Kuching (and Malaysia), for anybody who's never been there for long, or doesn't know too much about Malaysian culture. In any case, don't be afraid to step into what might be a strange world and culture to you, and don't believe too much of anything anybody tells you until you saw it with your own eyes! New: The Food Gallery by Wena. "As the plane started to descend, I took a peek through the window. A view of Mount Santubong towering the nearby Damai Lagoon Resort brought a homey smile to my face as I came to realize that I am a step nearer to home, my home. Why I have never actually see the beauty, the charm of Kuching through this angle, I didn't know. It hits me immediately to proudly write about Kuching - the heart of Sarawak, the heart of the Land of Hornbills. The view of the Sarawak River, curved beautifully cruising its way in between the mystical tropical rainforest followed. Rich diversity of untamed nature, the alluring charm portrays Sarawak within seconds. The plane has landed on Kuching International Airport after another soothing view of the beautiful paddy fields. Yes, I am finally home." Malaysian food can be very spicy. If you like hot food, you will be completely delighted by what Kuching has to offer. Dishes are mostly based on rice or noodles and served in small bowls, along with a soup. For some dishes you take a small spoon (in your left hand) and chop-sticks (in your right hand). Typical dishes include: Kolo Mee, Nasi Lemak, Laksa (Laksa Sarawak/ Sarawak Laksa), Kopa Ayam (Chicken Wings, "ayam" being "chicken"), Chicken Rice, and Roti Canai. You get the food in small to medium-sized food stalls for about 2-4 Malaysian Ringgits ("RM", what they also just call "dollars"). 3 to 4 Ringgit are about 1 Euro/ US-Dollar (for up-to-date figures, see the currency converter). The chili is often served as an extra so you can eat spicy if you want to. 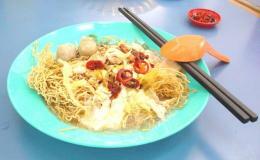 Kolo Mee ("Mee" means noodles) is very delicious. You can eat it every day, from morning to noon to evening (or even for supper, the late-night dish). You can get it for 2.5 RM, and add a drink. Drinks range from Teh Tarik Peng (tea with ice), to Kopi (coffee), to Teh Si Peng (ice tea), to Kopi Oh Peng (ice coffee), Ice Lemon Tea, or just Skyjuice (which is nothing else but plain water). You regularly find sugar on the table to add sweet. Drinks cost around 1 Ringgit in a kopitiam. If you're up for a local fruit, try Rambutan, or Durian (the "king of fruits", known for a strong smell, and outlawed in some hotels for that reason). For Malaysian recipes, see the cook-books section. In Kuching, you pay directly. There's different people serving you drinks and food. Often they don't come around your table so just ask for the food. People in Kuching speak English well. Tips are not common, especially in food stalls, the so-called "kopitiams". Kopitiams are mostly open long hours, some even for the whole day and night, seven days a week. For some dishes, you have to arrive early to get something. Some of the best Laksa stalls in town (the Chong Choon Cafe in Padungan) will only serve in the morning hours. Laksa is totally delicious and very special, I suppose especially to western tongues. It's spicy food for breakfast, soup and noodle based. Sarawak laksa is a cardiologist's nightmare of a breakfast. More cholesterol than you can shake a stick at, swimming in a delicious thick soup whose primary ingredient is santan (coconut milk), one of the richest vegetable sources of saturated fat. It's also got enough pungent spices to give a gastero-enterologist the jitters when he thinks about what it's doing to your colon, heaps of seafood itching to trigger off the slightest allergy, and sufficient highly refined carbohydrates to make your pancreas dance the tango. It's also one of the most sublime breakfasts known to man." Just like most everywhere else in the world, you'll also find western cuisine in Kuching. There's McDonald's (with some spicy burgers you won't find in other places), Pizza Hut, Burger King. Restaurants for things like a good black pepper steak include Amigos Pub, and the Westerner. Compared to local food, the prices for western food in Kuching are high. There's around 16 million people living in the whole of Malaysia, so there's no general rule how they are! Kuching people in general are very friendly and you can always ask them for help. There are a variety of races and religions mixed in Kuching. From the Malays (the Muslims, 21% in Sarawak), to the Dayak  descendants from the native tribes, like the Bidayuh (around 8%), the Iban (also known as the "sea dayaks"; around 550,000, or 30% of all Sarawakians), the Orang Ulu, or the Kayan  to the Ethnic Chinese (which also have different groups  like Haka, Hokkien, Foochow, Teochew, Henghua, Mandarin or Cantonese), to a few expatriates from German, Britain, or Australia. Mostly any religion is tolerated in Malaysia, even though it's officially a Muslim/ Islam state. Many people are Muslims (the Malays), or Christian (the Dayak, like Iban and Bidayuh, as well as most Chinese), or Buddhist and Taoist (the Chinese). There are also some Indians, who are Hindu. There are so many languages and dialects it can be quite confusing. You get around with English though, so don't despair. Even if strictly speaking English, if you're a "westerner", people won't be afraid to call you an Angmo in your presence  "Angmo"  "White Ghost" (or "English guy", wether you're from England or not). The main languages in Kuching (and other parts of Malaysia/ Sarawak) are BM (Bahasa Melayu, the official Malay language), Iban (which is close to BM, but not the same), Bidayuh (which has completely different languages for different "Kampungs", villages), to Chinese (the most popular Chinese dialect in Kuching being Hokkien), to English. The Malaysian English (or "Manglish") is not just common British English, but a "refined" version. For example people will often add a "lah" to the end of a sentence, like "Ya Lah" (meaning "Yes"). Or "No Lah" (meaning "No"). Or "Don't know lah!". Another specialty are sentences using "can" and "can not". "Can" in BM means "Boleh" and is also a frequently used word. So "can or not?" is a common phrase (you can simply answer with "Boleh lah!"). Also popular: "Is it? ", "Don't want!" ("doe-want"), and "What to do?". Some words in BM: "Apa Khabar?" ("How are you?" Or literally; "What's new? "), "Kereta" (car), "Boleh" (can), "Tidak" (no, not), "Jalan" (walk, road), Makan (eat, food, which would be "Makai" in Iban, and "Maan" in certain Bidayuh dialects), "Maaf" (sorry), "Selamat Datang" (Welcome), "Selamat Tinggal" (farewell), Terimah Kasih, or Terima Kasih Banyak-Banyak (thanks/ thank you very much, which in Chinese would be "Sie Sie"). And One-Two-Three would be Satu, Dua, Tiga. Well, for more Malaysian words and phrases, I suggest you buy a dictionary once there (or buy a dictionary online), or just ask for a pen and paper in a bar and let people write things down for you! There are many pubs to go for a drink and keep you entertained. Smoking is allowed practically everywhere except for closed restaurants (but note that expensive restaurants aren't the best way to get good food in the first place). You can order beer and liquors in every pub, but the prices are not as cheap as for food  ranging from 5-7 Ringgits in most places for the local Tiger Beer (or Carlsberg and Heineken), and up to RM15 in the most classy ones. Note: Whatever you do, try to avoid drugs! There's a mandatory death penalty for that in Malaysia. Places to visit at night include: Amigos (run by a German, John), Monsoon (with bartender Kandau), the Goal Cafe. Also worthwile are Soho, Grappa, and Tribes, just in the city center. A bit more out of town, the Mermaid bar. For a more expensive night trip, try out the Merdeka Palace, and up there go to its Victoria Arms (Friday Night is Ladies Night, most every-day is with Disco and Live-band). This one will cost you entrance of 25 Ringgit but it's worth it, and a free drink is included. Many other places have daily live-performances by talented bands with great lead singers, even though they mostly just play pop-charts, and rarely any original (or local) songs. But there's also no problem in taking out a Kuching woman, or having a relation-ship there. But note that it's against the Islam religion for Muslim women to sleep with any Christian men (or anyone outside of marriage, for that matter), and punishment can be severe. And like women all around the world, Kuching girls like to get gifts, and it's common that the men will pay for the drinks. You don't need to pay for all and everything, but if you're spending money, then don't complain about spending money  especially not to the woman! In general, be a gentleman and if you don't know someone, use less black humor/ sarcasm/ irony than you would in your typical western setting. The main celebration days/ holidays are: Hari Raya Aidil Fitri (end of ramadam, for muslims). Then there's Chinese New Year (end of January, with bigger fireworks than New Year, which is the "normal" end of December). Officially, fireworks are not allowed, but no one seems to care. And end of May there's Gawai for the Iban and Bidayuh. In September, try some cake with egg on the Chinese Mooncake festival. 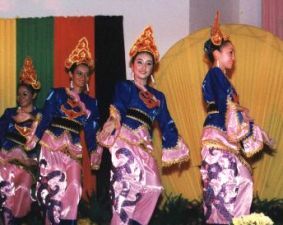 2003 was the year of tourism in Sarawak. There are hotels everywhere. The price ranges from around 50 Ringgits (or cheaper for hostels/ Bed & Breakfast, like the B&B Inn), up to anything imaginable. Most hotels are OK but don't expect "western" cleanliness from the cheaper ones. Places to look for: Kuching Hilton (expensive), River View Hotel (medium), City Inn Hotel (cheap), Marlin Inn (good but not in city-center), Regalis Hotel (again, good but not in city-center). There are around three main shopping malls in the center of Kuching: Parkson Grand, Tun Jugah, and Sarawak Plaza. Expect to find very cheap VCDs of yet to be officially-released to the DVD-market movies. Along the Waterfront, you'll also find souvenir and tattoo shops. If you're out of money, try the Standard Chartered Bank (Wisma Bukit Mata Kuching, Jalan Tunku Abdul Rahman, open Mon-Fri 9.30 am-3 pm, Sat 9.30-11.30 am. First & third Sat. of every month is bank holiday), or one of the many other ATMs around. Taxis are located at many places, especially around the city-center hotels, like the Kuching Hilton. They're easily visible with their yellow and red colors. You'll pay around 5-15 RM per ride. Just take with you a phone number (like 082-611 611) so that you can call a taxi next time. (The emergency number for Kuching, by the way, is 999). You can buy a hand phone in Kuching for around 200-300 Ringgits, and phone card credit starts at around 30 Malaysian Ringgit. Also see the Kuching map to get around by foot, and see the Kuching Maps book to buy (at Amazon.com). Sarawak, the largest state of Malaysia, is divided into nine sub-divisions: Kuching, Sibu, Miri, Bintulu, Sri Aman, Limbang, Sarikei, Samarahan and Kapit. It borders Brunei, Sabah and Kalimantan, Indonesia. From Kuching it's an 8-hour drive to Pontianak, Indonesia. There's much less tourism around than in Kuching, which already hasn't many tourists, so expect to be looked at as total stranger. But you will find nice people around here as well, helpful and willing to improve their English. You'll get around with BM in Indonesia as well, as it's very similar to what is spoken in Kuching. Other places to visit include: Singapore, Kuala Lumpur, Philippines, Brunei (no drinking alcohol at night here, though, since it's more strict regarding religion). Also, Thailand, most notably for tourists are probably Bangkok and Phuket, know around the world for the night-time entertainment and hospitality. Also from Kuching you can start to explore the great, varied jungle nature of Sarawak. Starting with trips to the museum in Kuching, or taking an half-hour ride to Damai Beach (and the nature resort/ cultural village), you can try to ask for a tourist guide in Kuching who will lead you to original Long Houses, or other places of interest. And don't forget to take your shoes off when visiting a house in Malaysia! (Otherwise, clothing rules aren't that strict in Kuching.) Also, there's some good places for scuba diving in Sarawak/ Malaysia. If you want to stay longer in Kuching than you expected (it may happen you fall in love with Kuching), you need to go the immigration office. The default staying period for Sarawak for most foreign countries is one month (three months for Kuala Lumpur/ West-Malaysia). After that, simply go to the immigration office in Kuching, and apply for an extension of your tourist visa. Pay one Ringgit at the counter, fill out the form (enter "vacation" as reason for the prolonged stay), wait a while, and you get your new stamp. After the period of three months in Sarawak/ Kuching however, you need to leave the country for at least 24 hours. I suggest a trip to Thailand with the airplane, which will cost you around 900 Ringgit. To keep up with your friends and family from back home (whereever you come from) you'll find a lot of cyber cafes with Internet connection in Kuching. Prices and speed vary, but it's relatively cheap. I suggest CPU Online, or Cyber City (at No. 46, Ground Floor, Block D, Taman Sri Sarawak, 93100 Kuching &#amp; just near Parkson Grand, and open from 10-10). Web cams, scanners, and color printers are available in some chat cafes. Or if you want to send snail mail, check by the post office on Tun Haji Openg Road (open Mon-Sat 8 am-6 pm, Sun 10 am-1 pm). You can ask around in Kuching if anybody has a room to rent, since the hotel can become costly for an extended stay. Room prices are around RM 200-500. Working in Malaysia is a bit more complicated, as there's a long process involved for foreigners (there's even hurdles for people from West-Malayisa/ KL), so I cannot cover it in the scope of this introductory Kuching tourist guide. For more background information, see Alan Spencer's article on Kuching and Sarawak History for the Kuching Quick Guide. "[You'll] learn to see beyond the stereotypes and misinformation that often precede a visit to a foreign land. Whether you plan to stay for a week or for a year, you'll benefit from such topics as understanding the rules of driving and monetary systems, religious practices and making friends." "Malaysians and Singaporeans are food obsessed: broach the subject of food with locals and it may appear that eating takes priority over everything else in life. The multicultural traditions of the region offer the food lover a gastronomic experience like no other  a fusion of herbs, spices, sauces and ingredients from a host of cuisines, each continually borrowing from the other. To eat or drink in Malaysia and Singapore is far more than an act of sustenance, it is a social experience  a chance to let your tastebuds savour the cultural m�lange of these two countries." I hope this guide was a helpful introduction to Malaysia in general, and Kuching in specific. If you want to write any comments, don't hesitate to do so. Also, I'm glad to be notified of changes and corrections. This information has been compiled in June 2003 based on my 9-month stay in this truly special place Kuching, Malaysia, from 2002-2003. To all my friends there, Lester L.C., Leslie, Fionara, Chelsea, Liliy & family, John N., Molly, Keith & staff, Kandau, Haren, Mary, Irene, Mike R., Ina & boyfriend, Peter C., Feng-Soon, Sandy, Mel, and all the others, thanks for being there! And to you, thanks for visiting! Copyright © 2003-2004 by Philipp Lenssen (kuching@outer-court.com). Credits go to Alan Spencer for his article on Kuching History and Alfred Molon for the Kuching town photo on this page, which is copyrighted to him and republished here with permission. For further information on Malaysia or this Kuching Guide, drop me an email, or just google Kuching or google Malaysia News, or Kuching News! For news, see the Official Sarawak Tourism portal. For all the facts, figures & statistics, see the World Factbook entry for Malaysia.